Love, Love, Love, trading art with other artists around this fine world. These two 5 x 7 journal pages that I just completed tonight are flying south tomorrow via Canada Post to my Californian Swap partner that I met on the Milliande ning site. Check it out! It is a great site to join if interested in swapping art! Can’t wait to see what I get in the mail from another artist in the group. Will share as usual when my 2 pages arrive. One of the pages had to use a home-made stencil of choice. I chose leaves. 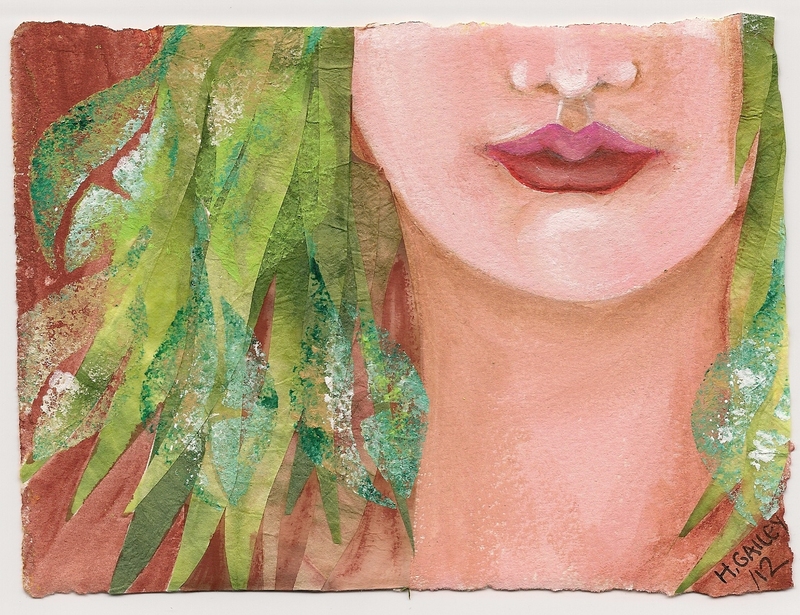 I painted it with acrylic paints on 140lb Arches hot pressed water-colour paper, and used handmade Japanese papers for her hair. 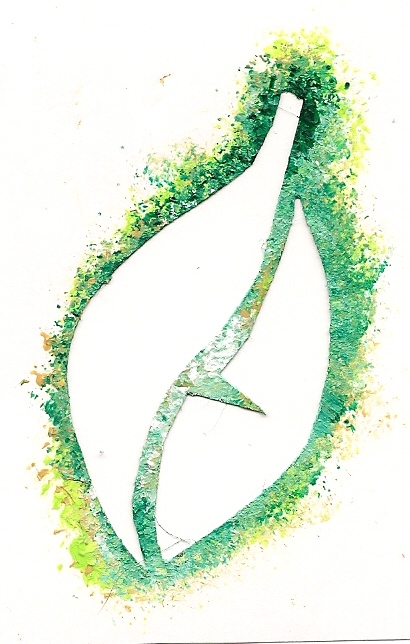 Here is the leaf stencil. Feel free to copy it if you like it. The next prompt was “Moon Magic” and you had to use the moon as your inspiration. I always remember that someone once told me that if two lovers or friends are apart and they look at the moon at the same time from wherever they are, then they are together in that moment. I wanted to use that same thought for making a new friend during this swap. 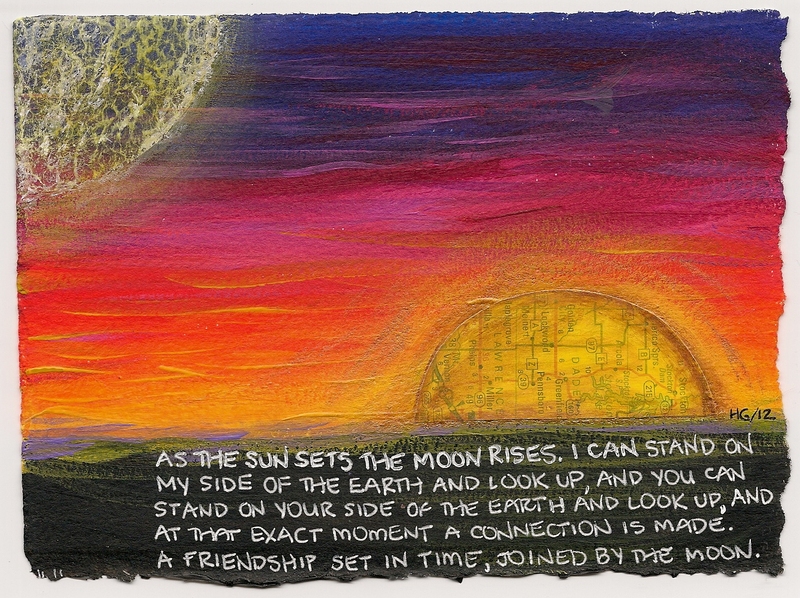 This 5 x 7 journal page was also painted using acrylics on water-colour paper. I used a vintage map piece for the sun and a piece of Japanese paper for the moon. The white printing is from a Gelly Roll Pen. Enjoy! These are really great and so creative! I love the idea of the “swap” and on your recommendation have just joined Milliande. There seems to be lots going on there – I hope I can find the info on signing up for a swap! HI there! Thank you for your kind comments. Once you join you can use this link to find the swaps that are going on. http://milliande.ning.com/group/atcswaps/forum. Another great site for swaps is Willowing.ning.com. On there you can join the “collab” group where we do journal passes and lots of other fun stuff. Hope to see you there! These are beautiful and I love the idea of sharing artwork.